As a self storage business owner/marketer, you’re well aware of the importance of Google My Business (GMB) listings. It is important for you to closely monitor each section of your GMB listing- description, photos/videos, questions and answers, reviews, and changes, if any. In our earlier blogs, we have discussed how to create and verify GMB listings and adding photos and videos. In this blog, we will take you through two critical features of GMB listings - Questions & Answers and Reviews. Google’s Q & A feature is quite interesting. It enables searchers to ask questions about your self storage business - prices, storage facilities, location etc. and you can answer them directly. It not only builds interest but also improves engagement with your existing as well as future customers. Here, you can not only demonstrate your strengths but also highlight your core competency. Your searchers are able to find answers to their queries and also get a better idea about your self storage facility. Do you store commercial items or residential items? Do you store boats and caravans? Do you sign a contract ensuring safety of my belongings? Using Google Maps on your mobile devices (Android as well as iOS), you can see, ask and answer questions. To use Google Maps on your mobile device, download the Google Maps app and sign in with the email address you use for your GMB listing. You can’t see notifications for Google Q&A on your GMB listings app. To check updates on questions and answers, you will need to install Google Maps on your phone. You can also search for your business on a mobile browser and check for questions that need to be answered. Google has recently introduced email notifications for every new question that is asked about your business. However, it’s quite possible that everyone associated with your GMB listing account may not receive these email notifications. We strongly recommend that you create FAQ’s list and upload it to your GMB listing. 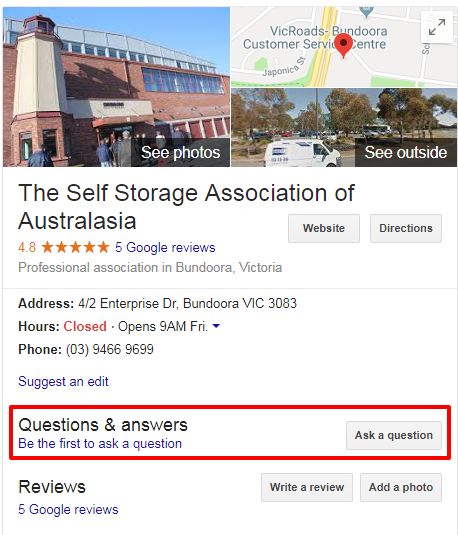 Consult with your marketing and sales teams and also your customer service team to identify the questions frequently asked about your self storage business, then put those Q&A questions on your GMB listing. The above stats indicate the importance of reviews for any business with a local customer base. Google encourages businesses to ethically ask users to write reviews about their business. Self storage business owners can bank on this opportunity for asking their satisfied customers to share their good feedback in order to gain credibility. This will also ensure that you have a “good image” online. 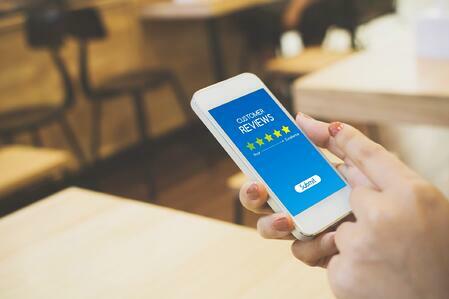 Additionally, online reviews are known to impact search result rankings, consumer trust, and click-through rates in a positive manner. Responding to reviews is more important than ever, with 30% naming this as key when judging local businesses. When a customer leaves a review for your self storage business, good or bad, ensure to respond to them. Responding to negative reviews is also important. Not every review will be perfect. What matters more is how you respond to negative reviews. But, what about fake or bogus reviews? Many times ex employees, competitors write fake reviews for the purpose of marauding your reputation. In such scenarios, you can report to the Google My Business Listings Forum to get your issue sorted. Wish to setup a GMB listing for your self storage business to enhance engagement with online searchers? Reach out to us and we’ll set this up for your storage facility. Prodigitas enables self storage business owners build sustainable marketing campaigns for their storage facilities.